As a part of its “Healthy Turf. 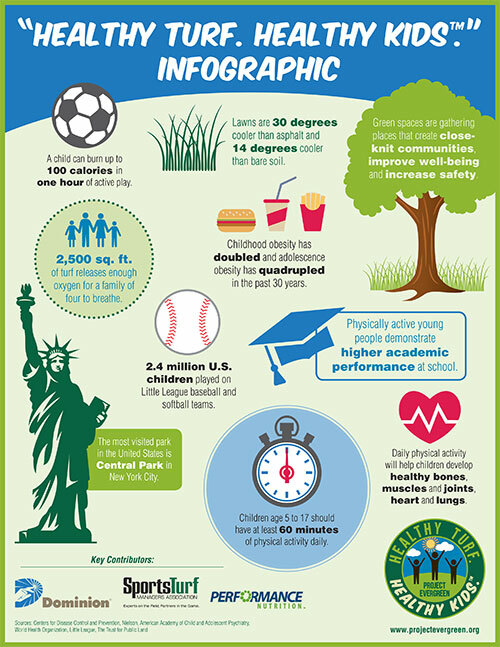 Healthy Kids.” initiative, Project EverGreen designated May 17-23 as National “Healthy Turf. Healthy Kids.” Awareness Week. The mission is to raise awareness of the program and spotlight its efforts to provide safe recreational and playing fields for America’s children. “Healthy Turf. Healthy Kids.” is Project EverGreen’s nationwide initiative to renovate and revitalize parks and athletic fields in urban communities. This year’s plans call for renovation projects in 50 locations, including Atlanta; Austin, Texas; Chicago; Cleveland; Dallas/Ft. Worth; Greensboro, N.C.; Milwaukee; Minneapolis; Portland; and Raleigh-Durham, N.C.